Want to learn a trading strategy that is less stressful and that will allow you the freedom of not looking at the markets everyday? Here is a simple trading strategy that might just work for you. With this knowledge in mind, let us delve deeper into this simple trading strategy. 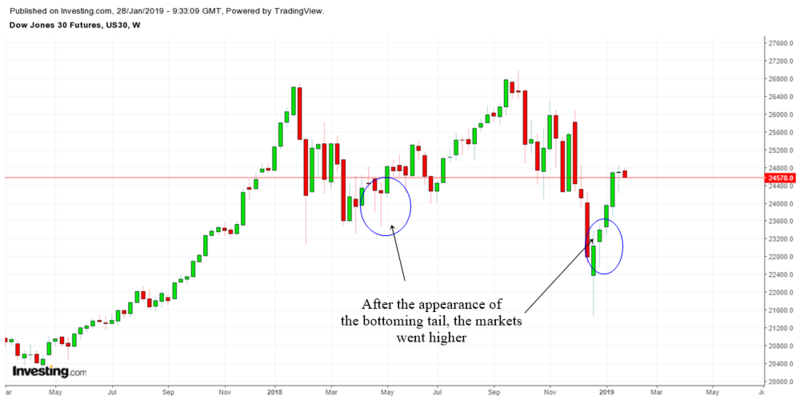 In order to understand the power of The Weekly Bottoming Tail Trading Strategy, you need to learn a bit about the Japanese Candlestick Bottoming Tail Pattern. It can be green in color, or red or black with no body or a small body. That's ok. The important thing is for it to have a visible long tail. Visible means can be seen clearly. If you have to squint your eyes to find it, then its not a bottoming tail. A bottoming tail tells us that the stock is rejecting to go lower. Just like a kid who refuses to eat their vegetables when you feed them. During the process of the formation of the bottoming tail, the stock went lower but throughout the entire week it went back up to close near the open. Something like a plane diving down near the ground only to do a sudden reverse and go back higher into the clouds. 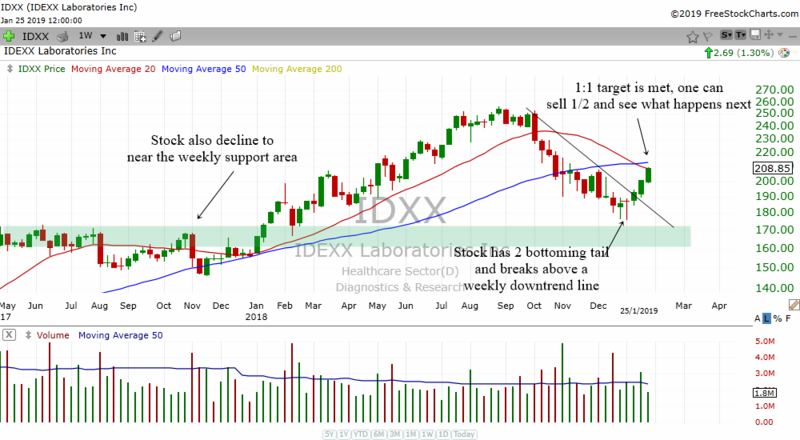 In order to find a trading candidate, one needs to zoom out into the weekly charts. You will find the "W" button in your charting system. That is a weekly chart. Take a look at the weekly chart of Dow Futures below and see the power of a weekly bottoming tail. In the chart above, we can see two bottoming tails. Notice how after the appearance of these tails, the market went higher. If you see these bottoming tails, you can position yourself and enter the market after they appear. It may take a few weeks for you to reap the rewards but it will no doubt put some profits into your account. If a bottoming tail appears in the weekly chart of a stock, it can often have a more significant move than the main index. Which is why it is a good idea to find trading candidates in stocks. Just enter when the stock trades above the highs of the weekly bottoming tail. In the chart above, you can see how FAST formed a weekly bottoming tail. To enter the trade, just buy the stock when it trades above the highs of the weekly bottoming tail. Trade management is also very simple. 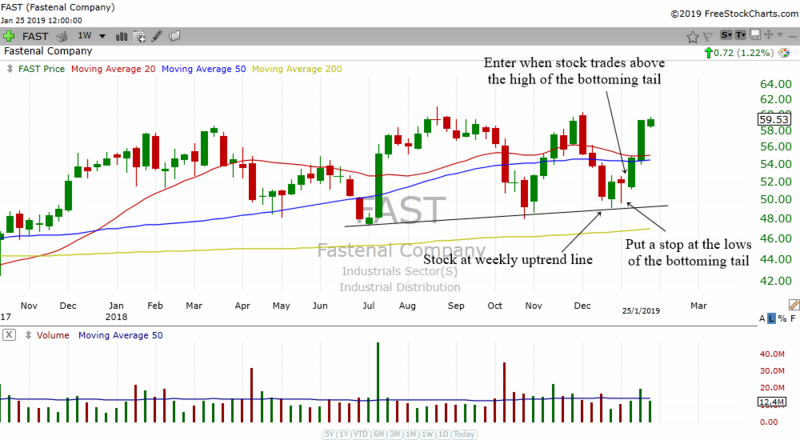 Put a stop loss at the lows of the weekly bottoming tail as shown in the chart above. But you can usually take the height of the bottoming tail as a target. This means if the top of the bottoming tail is 45 and the lows if 43, then you take the difference which is $2 as a target. Once you make $2 just sell half and see what happens. Your aim will be 1:1. Not a very attractive risk reward ratio but the success rate of this trading strategy gives it an advantage. Sometimes you will get a 1:1 ratio or less but you can sometimes get a 1.5 or 2 ratio. Those winnings will pay for the losses in the long run. How Many Trades Should You Take A Week? My experience with the markets is this...When the general markets make a weekly bottoming tail, you will often find lots of stocks making a weekly bottoming tail as well. Sometimes you are spoilt for choices. Since it is a weekly trading strategy you should not trade as much as swing trading or day trading. 1- 3 carefully selected trades a week is generally recommended rather than entering 10 different stocks each week. There are other factors to consider to ensure a better success rate. Where and when the bottoming tail appears is important. For example, in the daily chart you see a double bottom and when you zoom out into the weekly chart, you see a weekly bottoming tail. That is double confirmation that the stock wants to form a bottom. 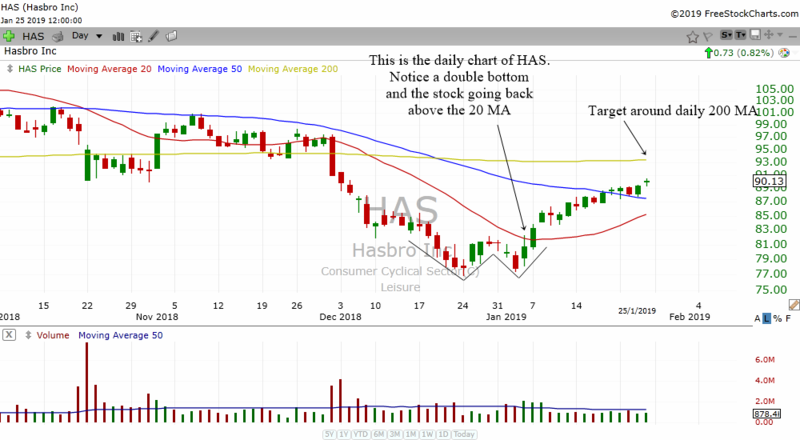 Below is the weekly chart of Hasbro. Notice how the stock formed a weekly bottoming tail. Prior to that, the stock formed a green candle which tells us there is a change from bearish momentum to bullish momentum. One can buy the stock when it trades above the highs of the bottoming tail. The above is the daily chart of the same stock. Notice how it formed a double bottom. 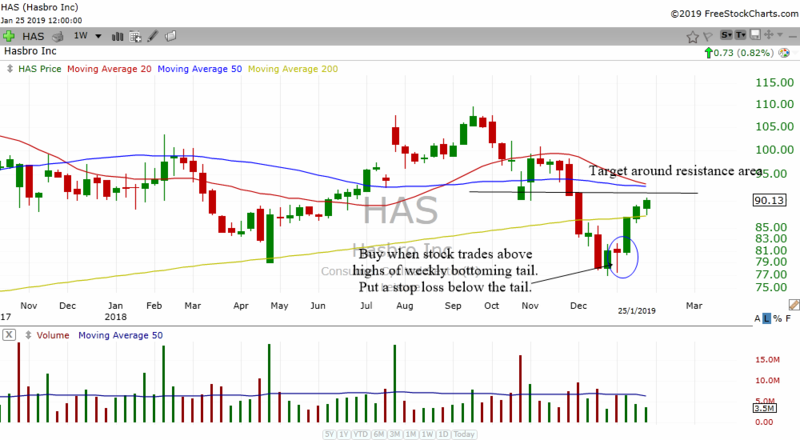 Notice how it trades back above the 20 MA as well. With a double bottom in the daily chart and a bottoming tail in the weekly chart, this tells us that the stock wants to bottom. Target will be around the resistance area or the 200 MA. There are a few things happening in this chart. So with these factors, one can have a high probability trade. Target of 1:1 is met and one can sell half of the stock and see what happens to the other half. The stock might just go up further. 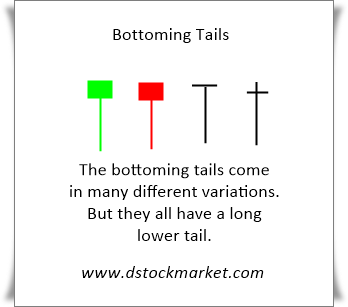 Bottoming tails can often appear in a stock that is trending upwards. A stock that is making higher highs and higher lows will look like its stock price is moving up a hill or mountain. 45 degrees angle upwards. Sometimes a bit steeper. Take a look at the weekly chart of Carimin above. It is a Malaysian stock. This shows us that the weekly bottoming tail trading strategy can work in any market in the world. Bottoming tail is often regarded as a bullish reversal pattern by traders. But did you know that they can often tell us of the continuation of an existing uptrend? Sometimes a stock might go up and then fear sets in and there is heavy selling for a few weeks. But by the end of it, a weekly bottoming tail forms. Well, it means that despite the heavy selling and fear, the stock does not want to go any lower. That is why it closed higher by the end of the week to form a weekly bottoming tail. When you see that the weekly 20 MA is up, it tells us that the uptrend in the weekly chart is still good. A weekly bottoming tail that forms above a rising weekly 20 MA can often be traded as a continuation pattern. 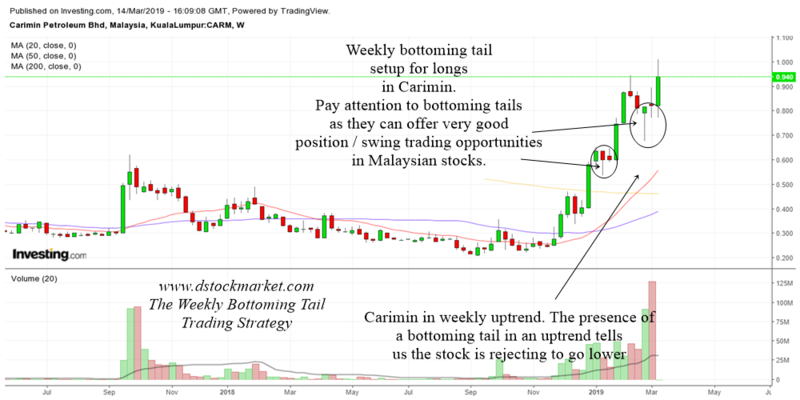 Carimin which is an oil stock in Malaysia formed 2 weekly bottoming tails in the chart above. Both times they work quite well to give traders a weekly bottoming tail setup. Traders can buy the stock when it traded above the highs of bottoming tail. We have already covered the stop loss just in case the trade turns sour. Other things to consider is how to handle the profits. Once you get a 1:1 profit, you might want to sell half and let the other half run. You should also raise the stop loss of the other half to breakeven (your purchase price). There will be many other stuff to consider but as you gain more experience jot them down in your personal diary. Apart from being easy to spot, I believe this trading strategy is less stressful. No need to spend too much time staring at screens. I shall try to add more examples in the future so you can see the many variations as well as learn more things with different examples.